Let’s start out with the easy one. Unlock deactivates all of the gag’s features, and removes the RLV detach restrictions so the gag can be removed. Clicking this will also hide the gag that’s in the wearer’s mouth, and – if it’s worn, make the gag hanging around their neck visible. Opens the Access menu which is only available to the wearer of the gag if they’re the one who locked it, and to the primary owner if one is set. Click here for detailed help. Secondary owners don’t get the Access button, but they can switch the gag’s Exposure from Public to Private and back. Key holders don’t get to change the gag’s access settings so the button is presented with a padlock icon to signify they can’t use it. Mild – Still fairly understandable. Moderate – Kind of understandable with practice. Receive but no start – Permits the wearer to engage in IMs as long as someone else starts the IM session. Blocked – No IMs at all. 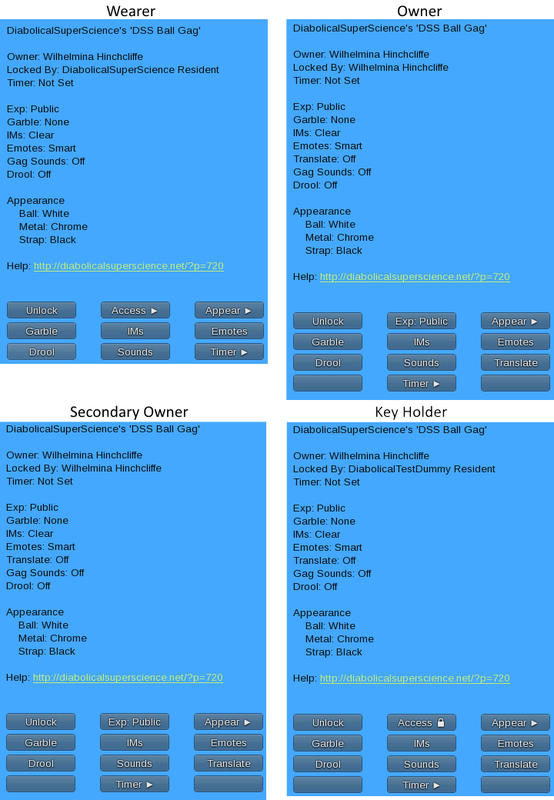 The gag automatically adds exceptions to the IM restrictions for the key holder and anyone on the owners list. Clear – No restrictions on emoting. /me smiles around the gag and remarks "this isn't so bad", then grimaces at the gibberish and continues "or maybe I was wrong" before quieting down. Wilhelmina Hinchcliffe smiles around the gag and remarks "ghif ifn'g fo bad", then grimaces at the gibberish and continues "ow maybe I waf wwong" before quieting down. Short – Limits emotes to 15 characters. Blocked – No emotes are permitted. Light – A single drool trail from the bottom of the gag. Medium – Two trails emanating from the corners of the wearer’s mouth. This toggles the muffled gag sounds on and off. This is one of the few options left available to the wearer when they’re locked out of the menu so they can turn the sounds off in locations where audible “MMgppfh hmmppfhg mmmmfhhh” might be unwelcome. This button is never available to the wearer. It toggles the Translate option on and off. When it’s on the gag will send an ungarbled copy of whatever the wearer is saying to the key holder and/or anyone on the owners list so long as those people are within normal chat range. Opens the Timer Menu. Click here for more detailed instructions.